TLDR; Get an SSL or you’ll lose your search ranking on Google. Starting in July of this year, Google Chrome will have marked all HTTP sites as “not secure.” Many websites have already started getting their SSL Certification to avoid being badly labeled by Google, and you should too. SSL, or, Secure Sockets Layer, is the “standard security technology for establishing an encrypted link between a web server and a browser.” So what does this mean? The SSL makes sure that all your data that is passed through to the website you’re using remains protected by that website. No one else can steal it. Without an SSL, random online users can sneak onto the website and obtain your information, (which can be really dangerous when passing credit card information or your social security). Have you ever noticed the difference between http and https before a websites domain? The s at the end means the website is secure and safe to use as it uses an SSL. Here’s some examples from local advertising agencies in Jacksonville. If a website is not safe for you to use and doesn’t have an SSL intact, Google will tell you straight out this website is not secure. It will also warn you from using any information of your personal information on the website. The most popularly used search engine, Google, is trying to make strides to better protecting online users. In 2014, Google created a ranking factor in which all websites that used an SSL would be more likely to come up in a google search. Those with an SSL saw a rise in their visitors. Now, they are becoming stricter and labeling websites that do not use an SSL as “not secure.” For websites who have this displayed, they will most likely see a drop in online users visiting their site. Would you want to go to a site that isn’t safe? 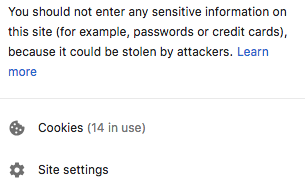 Google isn’t creating a law that you need to have one, but they’re basically blacklisting you if you don’t have an SSL. Pretty much any website that wants to be able to be found on Google will be affected. It will also affect online users by giving them a safe space to share their information privately. According to analytics, ⅔ of all websites will be marked as “Non-Secure.” That’s a lot of websites that aren’t safe. Many websites will be harder to find and you will be discouraged from using them by Google. Google just wants to make sure you’re safe! This is a good thing, and it’s really easy to get a SSL Certification. In fact, you can get one for free! SSLs are very important to have, especially in this day and age. “According to Cybersecurity Ventures, cybersecurity damages will cost the world over $6 trillion annually by 2021.”SSLS will protect you from cybercrime as criminals on the internet can identify where your information is being transmitted and how to access it. SSLS make it so your sensitive information is sent right to the server you want to be using. It’s also good for companies to validate their credibility and brand. Customers will more likely want to use a safe website than one that is not. There are many websites that offer a free or cheap way to get an SSL Certificate. We’re not going to advocate towards any one of them, because you get what you pay for and sometimes free means a whole lot more time configuring things you don’t have time or the knowledge to do. However, we get that you’ve made it this far so you want to know how to solve this without having to hire anyone. One of the most popular ones seen circling around the internet is one service called Let’s Encrypt. This is mostly for if your website isn’t handling sensitive information (credit cards, etc). Many hosts, including WordPress and SquareSpace, have an easy built in way to use Let’s Encrypt. Here is a full list of the Hosts that support Let’s Encrypt. There’s also a website called SSL For Free, which blankly states what it does. Depending on what information you collect and how you collect it, you may need to pay for it. That might seem annoying, but you’re more likely to lose more money if you don’t get it. Google will make it very hard to find your un-secure website, and even if customers find it, they will want to know their information is safe. There are five easy steps listed on howto-expert.com on how to buy one of these SSL Certificates. All in all, it’s not that difficult to implement SSL Certification and make a safe usable website. It’s what we do. But clearly, the rest of the world is in for a treat. Give us a shout if you need to get up to speed. 904.353.2900.